How far out is it possible to overhang blocks from the edge of a table without them toppling? No glue! 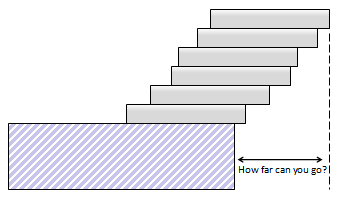 Blocks have to be placed and supported entirely by their own weights. Only one block per level. We're making a skewed tower. All blocks are of the same shape, weight, and are of uniform density. Obviously, as we build upwards, we can skew each level slightly to cause an overhang, but how far can we take this without it toppling over? Is it possible to build outwards from the edge of the table farther than the length of one of the bricks? If so, how much further? 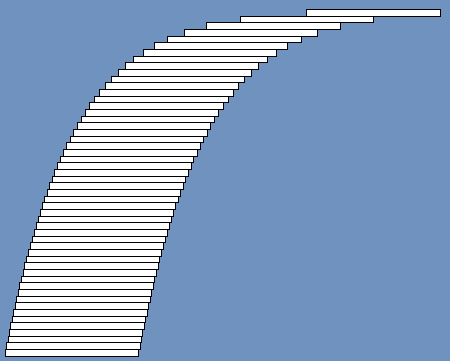 Is it better to make big skews (displacements) at the bottom of the tower and smaller at the top, or uniform skew all the way up the tower, or small displacements at the bottom and large at the top? I’ll give the startling answer first, and then proceed onto the proof. Yes, it is possible to build a tower that extends farther out from the edge of the table than the length of a block! This is one of those puzzles that, unless you’ve heard the solution before, defies belief. Yertle The Turtle would be very proud! Before that incredulous expression of disbelief evaporates from your face let’s walk through the physics. It’s all about the concept of Center of Mass. Let’s define all our blocks to be of length one unit, and of mass M.
With a single block resting on a flat surface, it’s weight force acts downwards. In accordance with Newton’s Third Law, this force is reacted by the table. (We can represent the weight of the brick by a single force passing through the center of mass of the brick). These two forces balance one another with no offset, so there is no torque, or moment, twisting the block. It is stable. It’s possible to slide the block towards the edge of the table, and providing the center of mass remains over the table, then the block is stable. If the center of mass moves beyond the edge of the table there is no way its weight can be reacted without a moment and the block will topple off the end. Game Over! We now have our solution for a one block tower! We can slide the block half way over the edge. This result is very important. It gives us the deviation of the top brick of the tower. In this case it's a trivial solution, because our tower is currently only one brick tall, but imagine that the table it is resting on is the rest of the tower beneath it. Whatever the make-up of the tower below, if it is stable, we can always place the top brick so that it extends half way into the void. A tower is just stable when the center of mass of its structure is directly above the edge of the table. As before, what we need to do is calculate the center of mass of the structure. Providing the combined center of mass of the structure remains over the table, we know the tower will be stable (and we already know that the top block is stable up until half way out). (The moment of the combined center of mass of the entire tower around the lower right corner is equal the sum of the moments of the individual bricks. Since the moment of the top brick passes directly through this chosen origin, it is zero). This gives us our second result. We can slide the lower block until 1/4 of it overhangs the edge. This will place the combined cener of mass directly over the edge of the table. At this point, the overhang is 1/2 + 1/4 = 3/4 of a brick. Now we're getting going … let's add another brick under these two. (As above, we know that the 1/2 + 1/4 configuration is stable, so we can place this two brick construct ontop of the third brick, instead of the table). Again we're looking to calculate the center of mass. 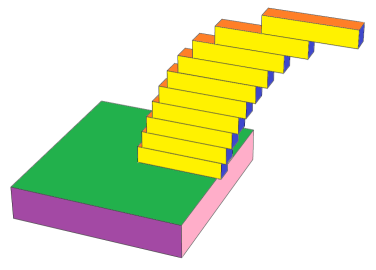 An alternate way to think of this is to coalesce the previous two brick solution into a single entity and place this on top of the third brick. 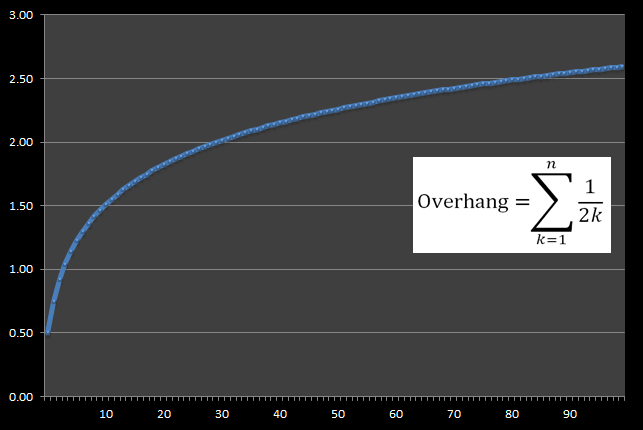 The combined overhang is now 1/2 + 1/4 + 1/6 = 11/12. This is close to one complete unit of overhang, but we're not quite there yet. 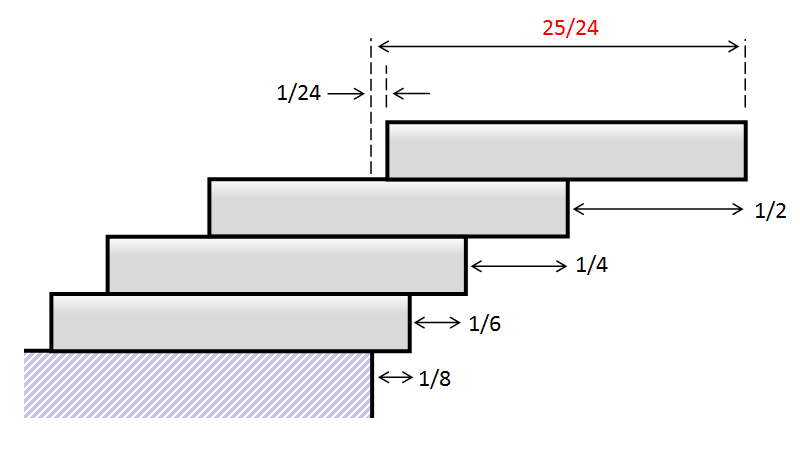 The combined overhang is now 1/2 + 1/4 + 1/6 + 1/8 = 25/24. This is greater than one! By the time we've placed our fourth block, if we're careful, we can balance it so that no part of it lays above the edge of the table! This is awesome! Mathematicians will recognize this as a Harmonic Series. As you can see, the solution diverges (albeit slowly). As calculated above, the overhang exceeds 1 after four bricks. As we will see later, to get to an overhang exceeding 2, we need 31 blocks, and to exceed 3 we need 227 blocks. If we were able to balance 100,000 blocks ontop of each other, the overhang would be just of 6.045 units. The first thing to notice is that this series is divergent. With each new level, the overhang possible increases. This gives the surprising conclusion that, theoretically, we can span any distance if we build our tower tall enough. There is no limit to how much we can overhang! In mathematics, Harmonic Series sums occur so often, they are given their own symbol: H(n) to represent the sum of the first n terms of the series. Those who have studied calculus may see the similarity between the term on the left, our Harmonic Series sum, and the standard integral on the right. At the limit, as we tend to infinity, the results merge. You may recall from Calculus that the standard integral of 1/x is ln(x), and the integral represents the area under the curve. The diagram below shows how the approximation is represented. 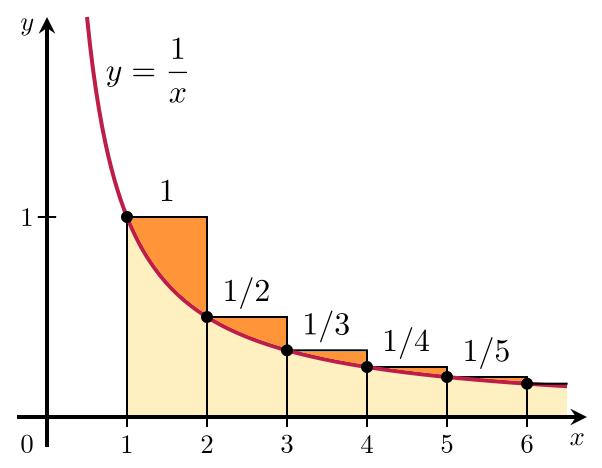 The logarithmic approximation under-counts the true summation of the rectangles by the regions shaded in orange. Whilst not currently proved, it is assumed that this constant (like Pi and e) is irrational. The formal definition of the constant is shown on the right. 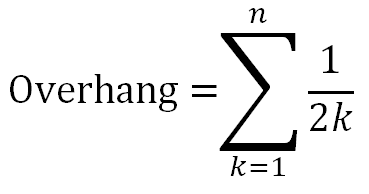 It is defined as the limiting difference between the harmonic series and the natural logarithm. Let's work with something easier to handle, a deck of cards. 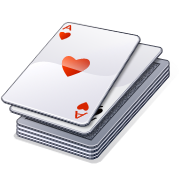 A standard deck of cards contains 52 cards, and is approximately 2 cm thick. With no wind, a lot of time, and a ridiculous amount of patience, it’s possible to make a tower like the one on the right. (Vertical axis not to scale). The overhang for 52 cards is approximately 2.269 times the width of one card. Not bad. Let's say your best friend's dad runs a playing card factory and you have access to millions of packs of playing cards, if you built a tower of cards as tall as the Empire State Building how much overhang could you get? The Empire State Building is 443.2m tall (that's 1,454 feet for my Metric challenged readers), that's about 22,160 packs of playing cards (thank you best friend's dad), which would create a stack of cards 1.152 million cards tall. Using our forumla we can calculate the overhang, and it's 7.267 units. Not bad, but I'd worry about the compression loads at the bottom of the pile! Let's say we wanted to double this overhang distance to 14.5 units. How many cards would this take? The staggering answer is 42 billion decks of cards. OK, now that you know the theory, go out and try it yourself! How hungover can you get?